When it comes to popular books, you can’t really get more popular than Harry Potter. My own kids are still too young for me to read this to them, but I’m patiently waiting for when they “come of Harry age”. In the meantime, it’s still fun to look at what other people do to show their fan-atical appreciation of the books. 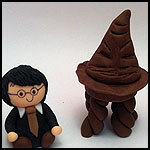 For the first post for this site, I decided to do a compilation of Sorting Hat cakes. I mean, aside from all the candy they eat on the train, the Sorting is one of the most exciting parts of the first half of the book! I don’t know how these people pulled it off, but some looked fantastic. Others looked downright scary! Be sure to check them all out. 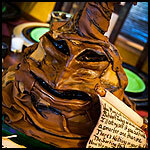 Looking for the most authentic looking Sorting Hat cake recipe? 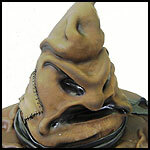 Try this one from The Leaky Cauldron by Margie Williams or head to her LiveJournal to see step-by-step photos. You’ll need to be one dedicated cake maker with either a good sized cake budget or already have on hand a lot of different sized cake pans. Those things aren’t exactly cheap! Preschool teacher Julie didn’t just make the Sorting Hat, she placed it on top of another cake and then made fondant emblems for all the Hogwarts Houses! Now that’s some dedication! Head over to her blog Cakes, Cookies, and Cupcakes, Oh My! to see close-ups of all her house shields. The Slytherin snake looked incredible! 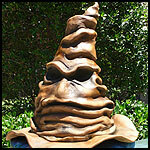 pastrybitch on Flickr made this incredible Sorting Hat cake for some kids at her local children’s hospital. Those sure are some lucky kids! I know a lot of “big kids” that would have loved it too! Cool hat aside, check out that amazing wand and Harry glasses!! I mean, what?!? So cool and crazy. I wish she’d taken a photo of the snitch. 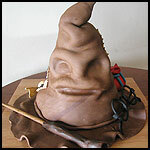 Not every Sorting Hat Cake needs to be done in fondant! Check out this cool buttercream frosted cake by Meg Ebersoldt. She used 3 colors of buttercream and then piped it on as stars. You have to admire her piping skills. It had to be extremely hard to get the facial expression of the hat and then do the patch at the top too! 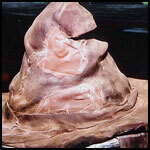 Don’t want to make an entire Sorting Hat cake? 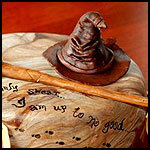 You can top it with a fondant decoration shaped to look like the Sorting Hat, complete with the table he sits on while sorting! craftyrosy’s shop on Etsy has cake toppers for tons of Harry Potter characters including Harry, Ron, Hermione, Dumbledore, Hagrid, Snape, and even Draco! A woman on the Cake Creators group at Disney posted this image of her Sorting Hat cake that she made for her niece’s birthday party. While the work looks fantastic, I have to admit I might piss my pants if I had that cake at my birthday party. I do respect the amount of work that had to go into that though! 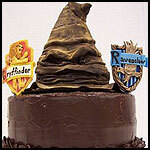 Don’t want to make your own Sorting Hat cake? You can always just buy one for only $195.00! Yikes! Coming from someone that’s never spent more than 30 bucks on a pre-made cake, that’s a bit out there in the price range! That aside, this seems like a cake more for Halloween than a birthday. He looks seriously angry! Although this probably would have looked even better dusted with cocoa powder, I think this is one of the best cakes I’ve seen so far. The wrinkles in the hat look awesome and the hat looks just like the one we see in the movie without looking scary. Love to Cake posted this on Flickr but didn’t offer any details. I especially love the snitch, Gryffindor scarf, and wand! 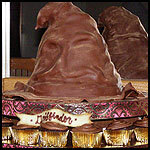 The Quirky Confectioner on Flickr made this Sorting Hat cake for a 10th birthday party for her co-worker’s daughter. The “ribbon” is particularly impressive! 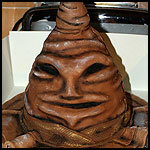 The mouth makes him look friendlier than some of the other scary hat cakes. He looks totally ready to put you into Gryffindor instead of Slytherin, no matter how great you could be. 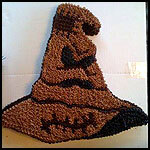 Stephanie of the blog Sweet Memories made this monstrous Sorting Hat cake that combines not only the Sorting Hat, but a huge display of cupcakes all around him! That sure is one heck of an effort to put into a birthday cake! Plus chocolate ribbons representing each house? Sign me up to be her kid right away! Jenn has a strong passion for all things Harry Potter and this cake, complete with wand, Marauder’s Map footprints, Gryffindor scarf, and mini Sorting Hat topper totally shows it. If this is your cake and I credited the wrong person, please let me know. And may I just say, you rock my socks. The marbling on the cake is really cool, too! 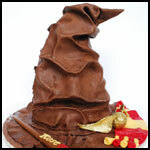 The Sorting Hat cake to end all Sorting Hat cakes. I mean seriously, the fondant “leather” even has wrinkles in the wrinkles. And don’t even get me started on the painted train. This cake was made by Highland Bakery in Atlanta, GA. When you look at their entire gallery, you have to wonder why they’re not on Food Network. Pre-Order Harry Potter & The Deathly Hallows & Get 10% Off Official Merchandise! Shop Now!